The Department of Climate Change base their case for Anthropogenic Global Warming (AGW), now referred to as ‘Climate Change’, on an uncritical acceptance of the IPCC’s Reports. Claims are made that these findings are supported by a ‘consensus’ of scientists and scientific opinion. This however is increasingly not the case as literally thousands of peer reviewed and published papers and many thousands of highly respected scientists, including some who contributed to the IPCC Reports, are now concerned that these findings lack an adequate or convincing scientific base. The infamous ‘Hockey Stick Graph’ (Mann et al.) has been comprehensively discredited and has been removed by the IPCC from their 4th Report. It is therefore surprising to still find it in the government’s section on the scientific justification of ‘Climate Change’. Likewise the claims that temperature has historically over the last 650,000 years moved in close relationship with levels of CO2 in the atmosphere is disingenuous. The Vostok and other ice core data clearly show that there is an average 800-year lag time between temperature rise and the subsequent increase in CO2 levels. 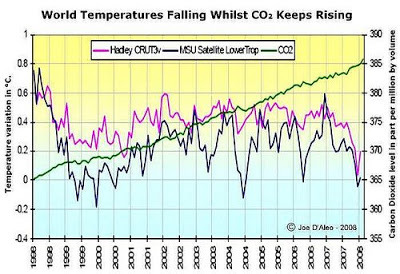 This clearly indicates that CO2 was not the cause of the warming but resulted naturally from it, and that the peak levels CO2 reached did not inhibit the subsequent coolings that occurred.